I have a special Saturday post for you today. I put together several of my NEW summer favorites, all under $50. Tops, dresses, lipstick, earrings, and amazing detailed bags. And now is the time to snag them while they're hot because things go fast and fall apparel is fast approaching. I hope you're staying cool this weekend. This past week we actually had a heat advisory because the temperatures have been well over 100 degrees. All I can say, is luckily we don't have humidity! We're headed to Justin's company's Family Day this morning and I'm hoping we'll miss the hottest part of the day. They are having a carnival theme which should be fun...I'm most excited about the cotton candy, taco truck, and shaved ice. Clearly, I'm coming for the food haha. The rest of the weekend will be spent watching the Harry Potter marathon on Freeform, taking some blog photos, and getting organized. I was so proud of myself for sticking to my personal schedule for the first time this week. I always have a "plan" for my week but I usually deviate from my original goal. But not this time! Below I've linked all of the items above, in addition to some other pieces I'm loving under $50. So many cute cut-out tops and ruffles! And all of the blush and white...loveee. 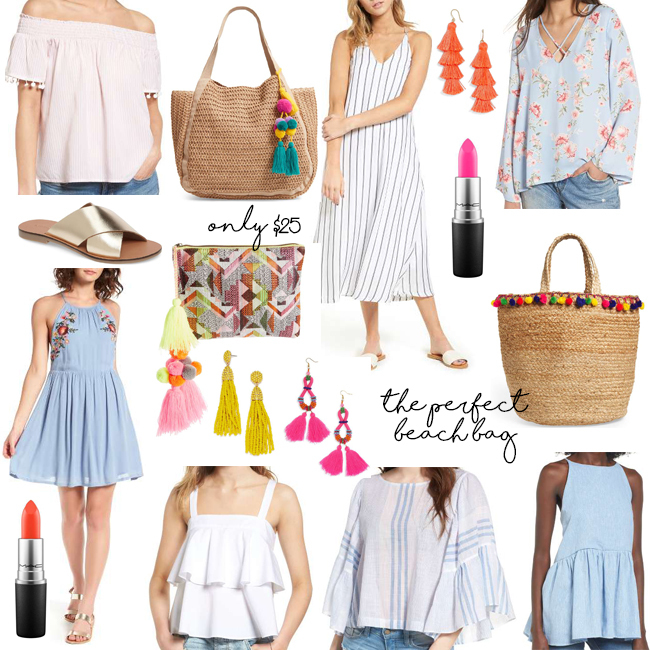 I have to say my must-haves are the white ruffle tank, pom beach tote, and the striped midi dress. Let me know which item is your favorite in the comments section below and have a fabulous weekend!